Quite amazing! Somehow the "inner prismatic" surfaces facilitate these complex raypaths? Interesting indeed. I guess the effective aspect ratio of the prism is decreased (the prism is shortened) by these additional inside-protruding surfaces, thus increasing Tricker raypath occuring percentage. btw. : Nice to see haloPoint producing similar results with another software. Actually I think there is some other mechanism involved than just shortening of the column because even with short columns you get strong but not complete Tricker and subhelic arcs. I don’t really know how this is happening. It could be a combination of external and internal reflections, or maybe rays somehow traveling inside the thin crown at the edge of crystal. Nice job Nicolas! We have always been lacking possibility to apply these inner structures for simulations. Have you tried other possible halo makers like capped columns? Also you should try to make ellipsical halo simulations with that program. There is some unsolved questions about elliptical halos. Wow interesting here I habe always thought columns with those cavities on the ends would block tricker arc rays rather than enhance them. 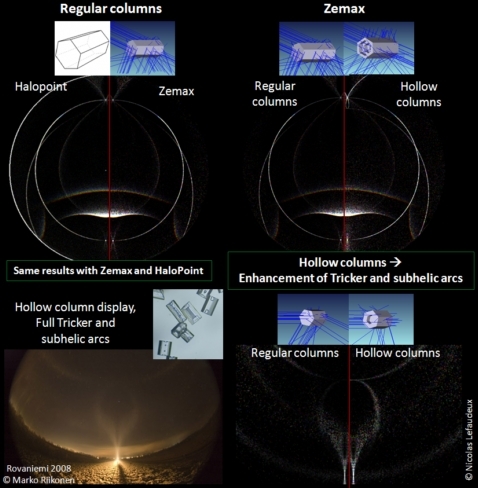 Ok, now I am not sure if the hollowed column better reproduces my display concerning the Tricker arc intensity, but what I am more excited about this is the disappearance of "sun cross" in the hollowed crystal simulation. And in general to finally have the first simulations with "inperfect" crystal. The path with the traditional convex solid single crystals has been traversed through long ago. At first we had only the regular heagons to work with. Then came the possibility to change the crystal face ratios, which provided moments of elightement for a while. But now even that path is pretty much beaten. So the next step is start incorporating truly natural looking crystals in the simulations with their cavities, air bubbles, ridges and depressions. There are already algorithsm that simulate these kind of crystals, perhaps they could be incorporated in the halo simulation programs one day. And of course also the clustered crystals are a new interesting path to follow. Yeah, it is great work from Lefadeux (as always). I can think of several cases where we could try these "imperfect" crystals. incorporating bubbles and cavities is very easy using zemax. I have several ideas and simulations in progress, I will share them here when they are more ready to be shown. I'll also add the capped columns on my "to do" list, others are already on it! Hello Nicolas, very impressive work! Did you use the same shape for all the hollow columns or some varying inner structure throughout the crystal set? Could you show the region close to sun in more detail? Recently, we have a discussion in the german message board about what we can see there. I used the same shape crystal for each simulation. The crystal drawn on top is the one used for each simulation. I will try to do a close up simulation of the sun region this week end. I had a look to the german forum, and I don’t think it there is anything of elliptical halo in the sun region. I think it is just artefacts caused by the left/right symmetry in the simulation and the jpg compression. These crystals were replicated with Riikonen in 8-9 December 2010. I just photographed some of the crystals as I got my microscope setup running again. The cavities, pores and other structures will indeed prove a fascinating world to explore!